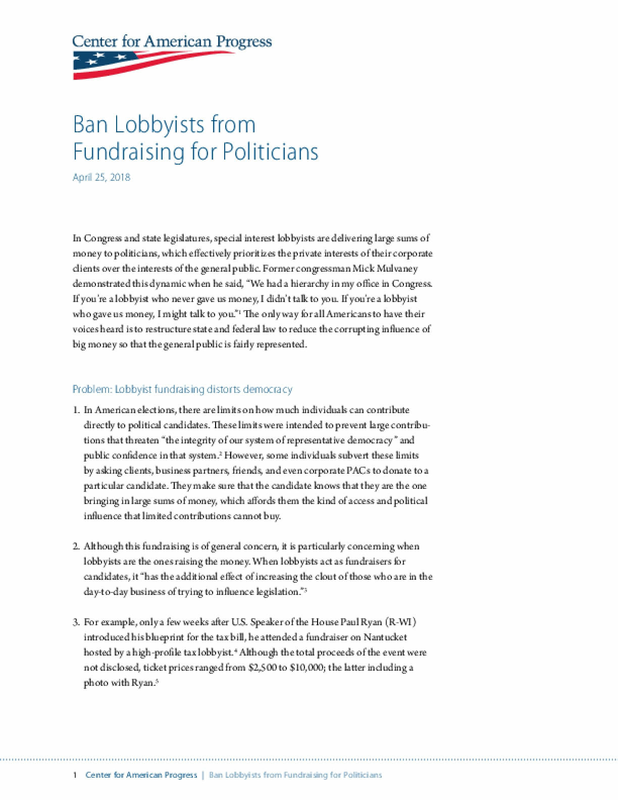 Since the Supreme Court's 2010 decision in Citizens United v. Federal Election Commission, proponents of stricter campaign finance regulation have increasingly prescribed "disclosure" as an antidote to "dark money" in politics. 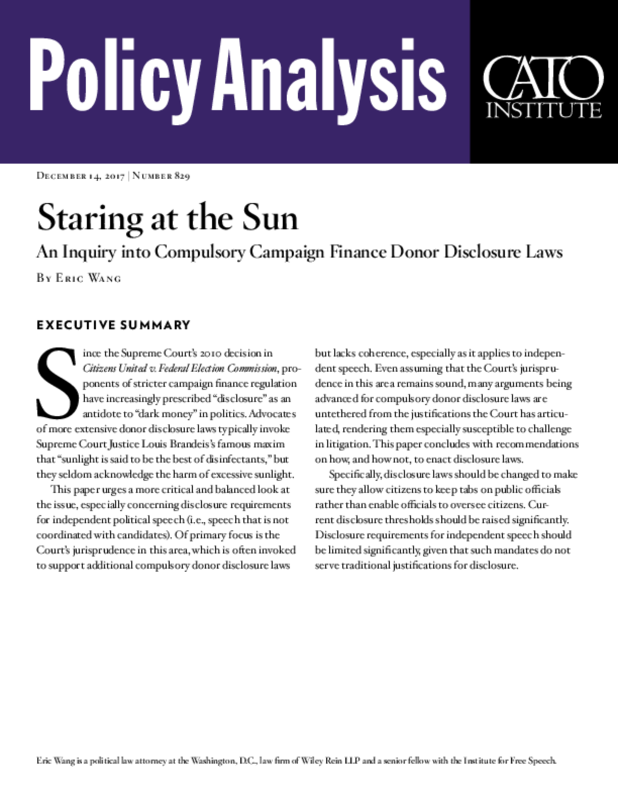 Advocates of more extensive donor disclosure laws typically invoke Supreme Court Justice Louis Brandeis's famous maxim that "sunlight is said to be the best of disinfectants," but they seldom acknowledge the harm of excessive sunlight. 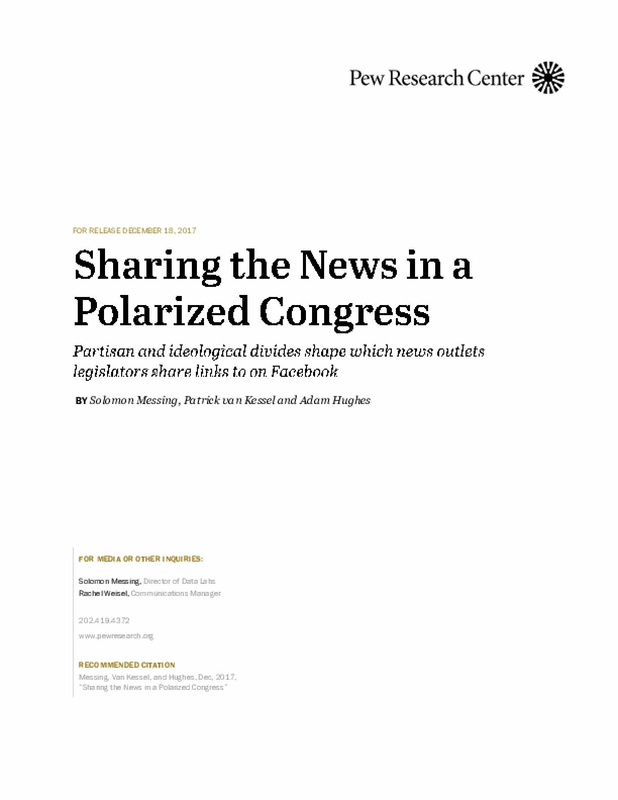 This paper urges a more critical and balanced look at the issue, especially concerning disclosure requirements for independent political speech (i.e., speech that is not coordinated with candidates). Of primary focus is the Court's jurisprudence in this area, which is often invoked to support additional compulsory donor disclosure laws but lacks coherence, especially as it applies to independent speech. Even assuming that the Court's jurisprudence in this area remains sound, many arguments being advanced for compulsory donor disclosure laws are untethered from the justifications the Court has articulated, rendering them especially susceptible to challenge in litigation. 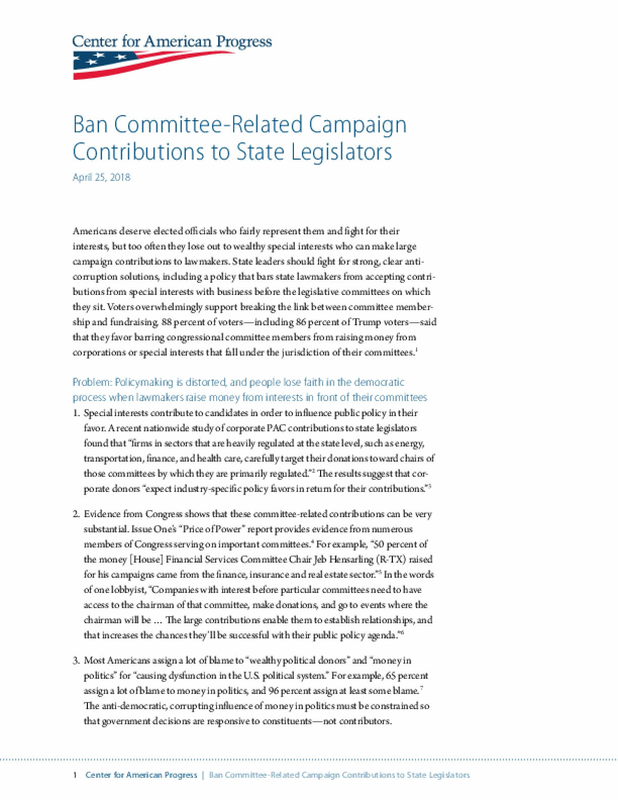 This paper concludes with recommendations on how, and how not, to enact disclosure laws. Specifically, disclosure laws should be changed to make sure they allow citizens to keep tabs on public officials rather than enable officials to oversee citizens. Current disclosure thresholds should be raised significantly. 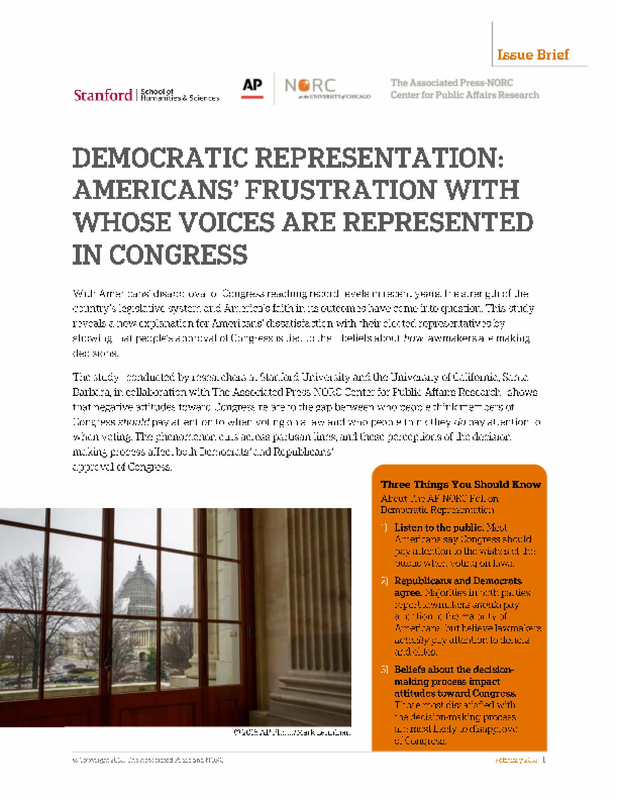 Disclosure requirements for independent speech should be limited significantly, given that such mandates do not serve traditional justifications for disclosure. 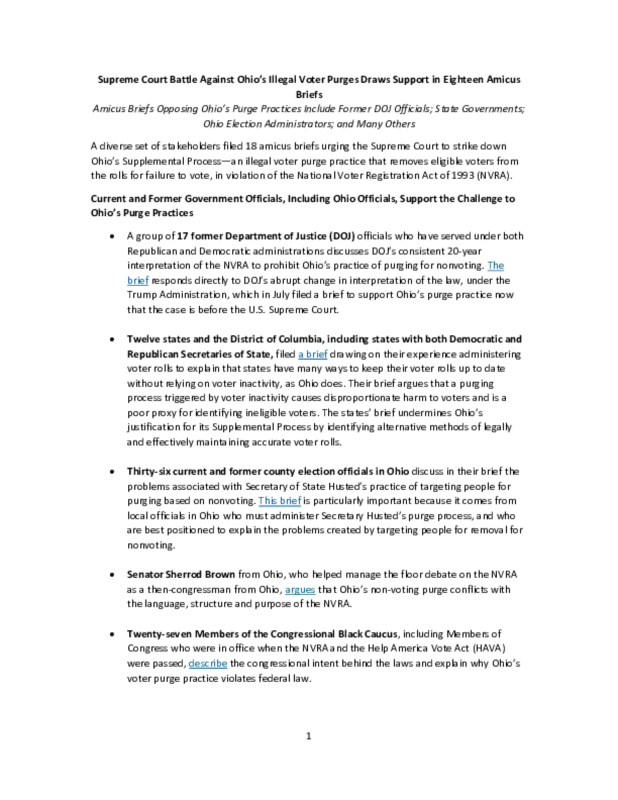 A diverse set of stakeholders filed 18 amicus briefs urging the Supreme Court to strike down Ohio's Supplemental Process -- an illegal voter purge practice that removes eligible voters from the rolls for failure to vote, in violation of the National Voter Registration Act of 1993 (NVRA). The popular contention that income inequality is turning our democracy into an oligarchy that serves only the rich is buttressed by several well-cited, but fundamentally flawed, academic studies. 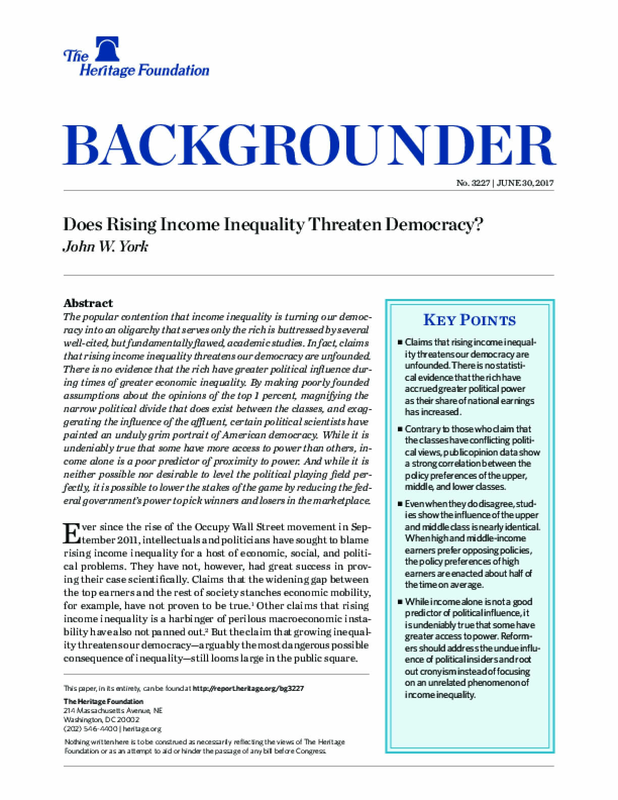 In fact, claims that rising income inequality threatens our democracy are unfounded. There is no evidence that the rich have greater political influence during times of greater economic inequality. 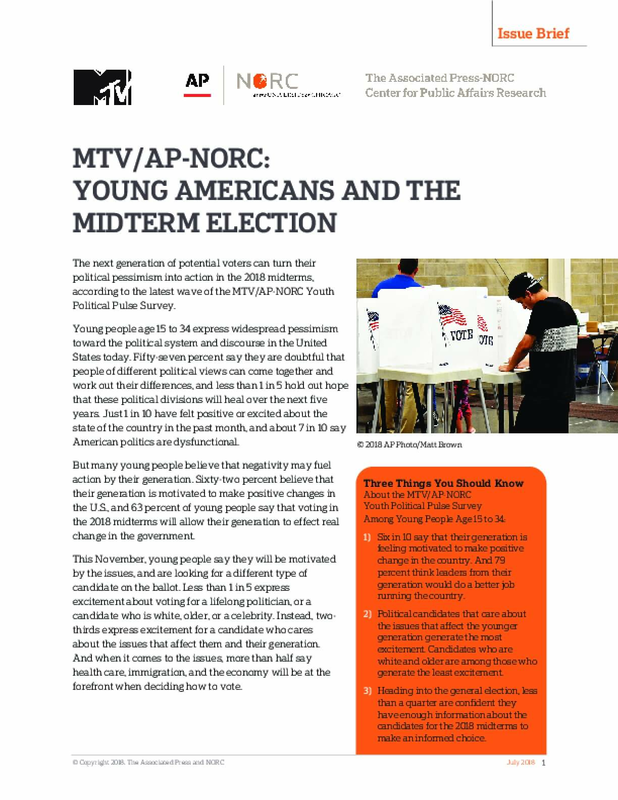 By making poorly founded assumptions about the opinions of the top 1 percent, magnifying the narrow political divide that does exist between the classes, and exaggerating the influence of the affluent, certain political scientists have painted an unduly grim portrait of American democracy. While it is undeniably true that some have more access to power than others, income alone is a poor predictor of proximity to power. 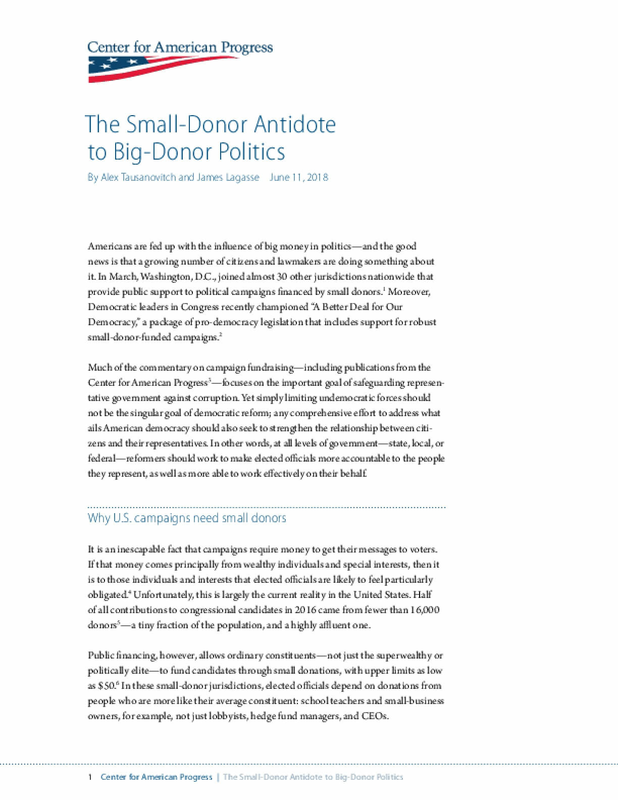 And while it is neither possible nor desirable to level the political playing field perfectly, it is possible to lower the stakes of the game by reducing the federal government's power to pick winners and losers in the marketplace. President Trump has promised to induce $1 trillion of new public and private investment in infrastructure over the next decade. He believes that strategy will be beneficial both for short-run, macroeconomic reasons (it will stimulate the economy) and for long-run, microeconomic reasons (it will improve productivity). 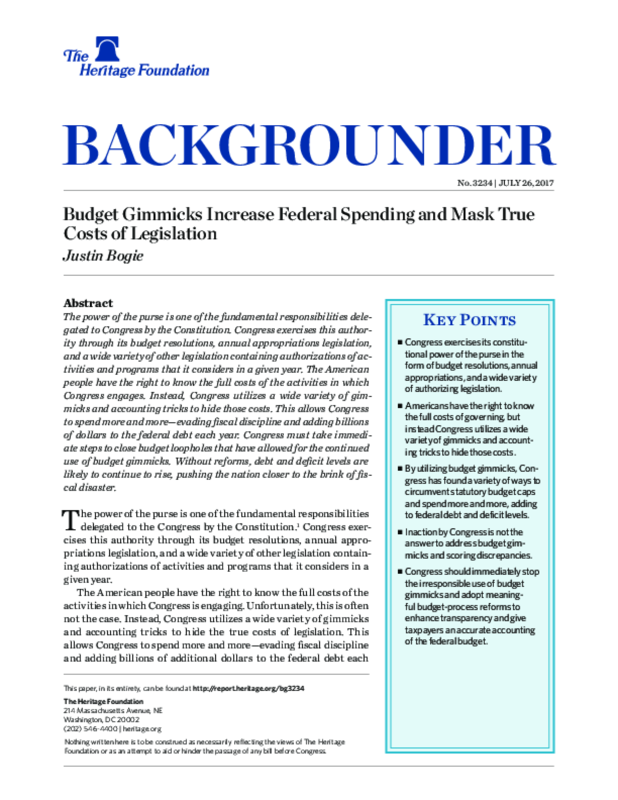 This paper assesses both sets of reasoning, finding that the case for more government investment is significantly weaker than commonly asserted. Because the United States is at or near full employment with interest rates rising, standard Keynesian arguments do not suggest infrastructure spending financed by borrowing would offer a macroeconomic stimulus. In practice, major projects take years of planning and cannot be used readily to manage the economy anyway. Historical evidence showing significant positive effects of government infrastructure investments on productivity provides little guidance on the worthiness of new projects today. Congestion and changing demand patterns do necessitate new infrastructure investments, and government spending in certain areas can enhance growth. But U.S. infrastructure is not in the dire physical condition asserted by politicians, scope for more private funding is ample, and resources allocated through the political process are often badly managed and prioritize ambitions that undermine economic performance. 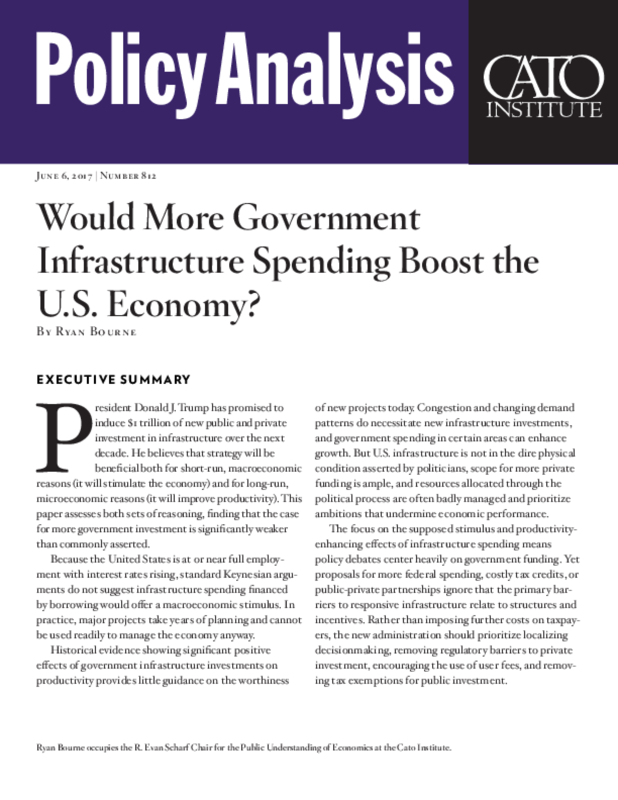 The focus on the supposed stimulus and productivity-enhancing effects of infrastructure spending means policy debates center heavily on government funding. 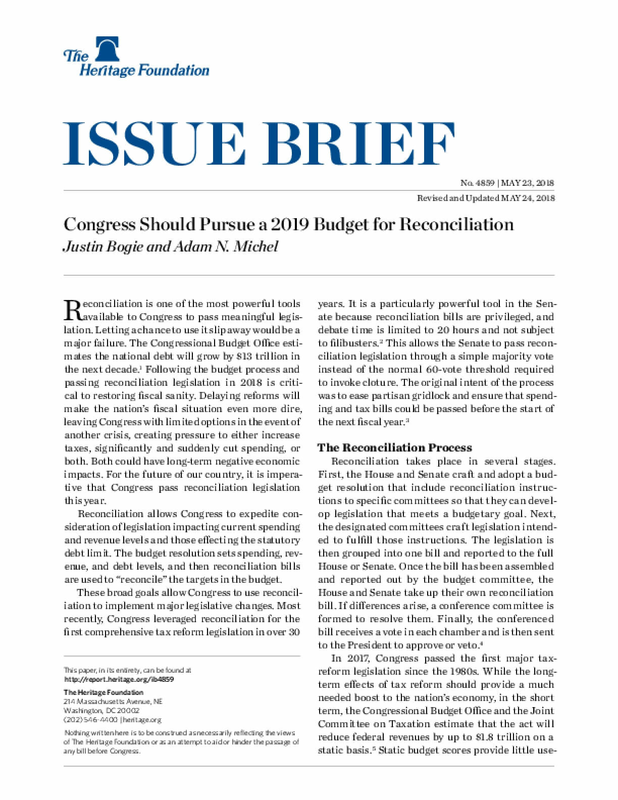 Yet proposals for more federal spending, costly tax credits, or public-private partnerships ignore that the primary barriers to responsive infrastructure relate to structures and incentives. Rather than imposing further costs on taxpayers, the new administration should prioritize localizing decisionmaking, removing regulatory barriers to private investment, encouraging the use of user fees, and removing tax exemptions for public investment.